Floor tiles can add a distinctive look to your room and freshen the décor. Floor tiles come in numerous types, styles and materials, from natural stone to linoleum to porcelain. If exposed to extreme heat levels, some tile materials, such as linoleum, will melt relatively quickly. 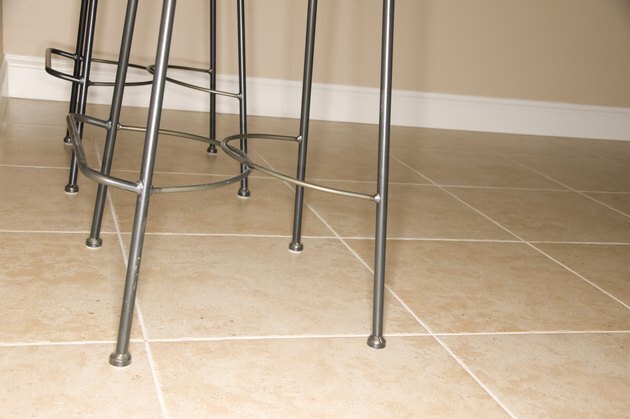 Porcelain tile, on the other hand, can withstand higher temperatures. Porcelain tiles can withstand high amounts of heat and is considered a relatively durable flooring material. Porcelain tile is comprised of a ceramic product containing kaolin clay and other raw materials. Those materials are heated in a kiln at temperatures typically ranging between 1,200 and 1,400 degress Celsius. The porcelain is then molded into the desired shape and size to form the tile product. Porcelain can withstand high temperatures due to the formation of mullite during the heating process. Mullite, also known as porcelainite, refers to a silicate material that takes the form of needles within the porcelain. Mullite is considered refractory, or a material that maintains its strength at very high temperatures. The melting point of the mullite, which helps porcelain maintain its shape and integrity, is 2,400 Celsius. This high metlting point allows porcelain tiles to be conidered heat-resistant and allows them to withstand the heat produced by contact with hot pots and extended periods of time in direct sunlight.